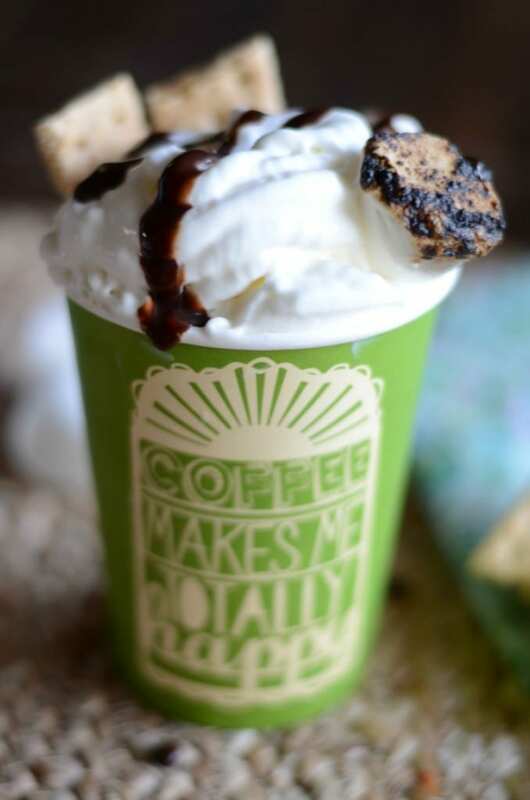 In search of a decadent DIY coffee recipe? You’ve found it! 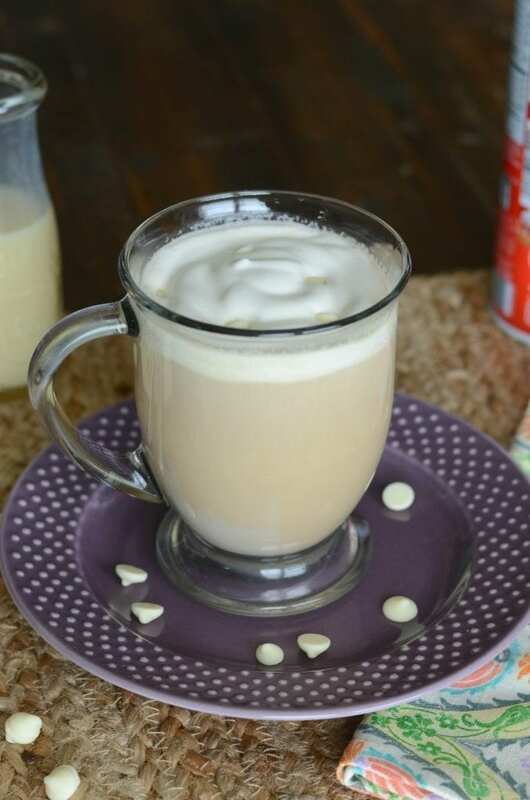 This cookies and cream latte is easy enough to make quickly for an extra special coffee break. One sip and you will be hooked. One of my favorite things to do is splurge on a fancy coffee drink, alone. I don’t do it often and that makes it extra special when I am able to get out for my coffee treat. Some people buy designer clothes, I like to drink fancy coffee. 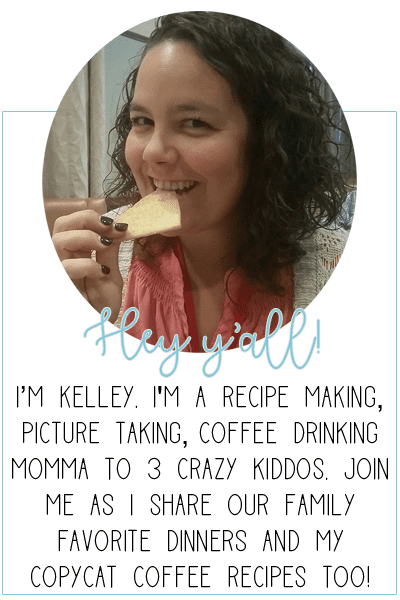 But real talk momma friends – even though I only go for a fancy coffee every once in awhile, I still have to fight that twinge of mom guilt. I shouldn’t have spent that much. I could have bought this for the kids. I didn’t need this time away. And sometimes I want my fancy drink more then once a month and just can’t make it out alone. My solution? Make fancy DIY coffee drinks at home! 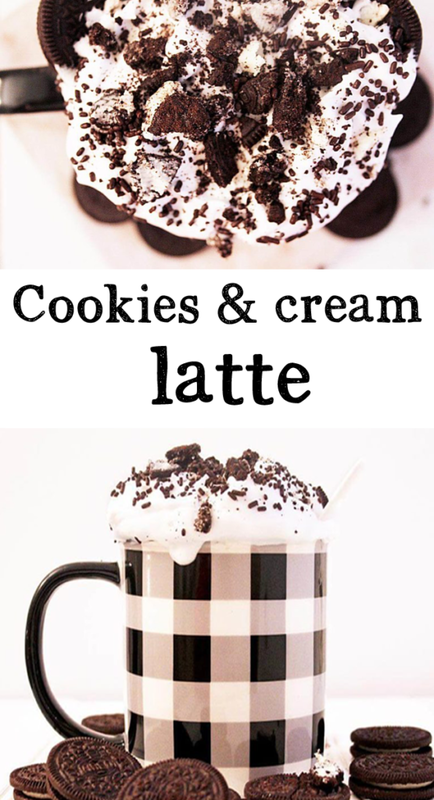 I would own hundred percent classify this cookies and cream latte as a fancy drink. I mean look at it, it’s oozing with whipped cream and crushed cookie goodness. 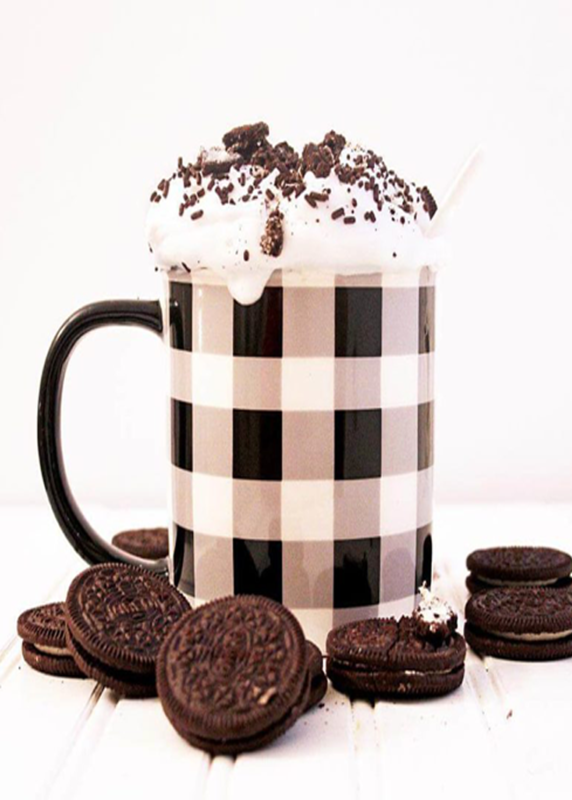 The cookies and cream latte is a combination of chocolate syrup and vanilla ice cream mixed together with hot coffee. It’s almost like an affogato, but with a bit more pizazz. The best thing about this latte is that it uses basic ingredients. Nothing special needed to make this drink, just common ingredients coming together to form one delicious latte. Once you have all your ingredients, you can make this drink over and over again. You want a good quality coffee here or even an espresso. I suggest a medium roast so it doesn’t overpower everything else. You can also use whatever strong, hot coffee you have on hand or instant espresso. Feel free to use vanilla extract or a vanilla syrup for this recipe. I love homemade vanilla extract because it’s only a few simple ingredients and so good! Torani vanilla syrup is my favorite store bought syrup. For the chocolate syrup – choose between homemade or store bought. I know homemade isn’t always an option, but if you use chocolate syrup often, it ends up cheaper making your own. Our homemade chocolate syrup recipe only uses 3 ingredients and it’s amazing! For store bought, I recommend Ghiradelli or Torani chocolate syrup but Hershey’s works just as good. Same thing for the vanilla ice cream – pick between store bought or homemade. Honestly, unless it’s summer time and I’m making homemade vanilla ice cream with the kids already, i normally always go store bought. I like plain vanilla but a French vanilla ice cream gives this drink an extra depth of flavor. Start by mixing your chocolate syrup and vanilla extract in your mug. Pour the hot coffee over it and stir to combine. Carefully add in your scoop of vanilla ice cream. If you want, add in a little bit of milk or half and half here as well. 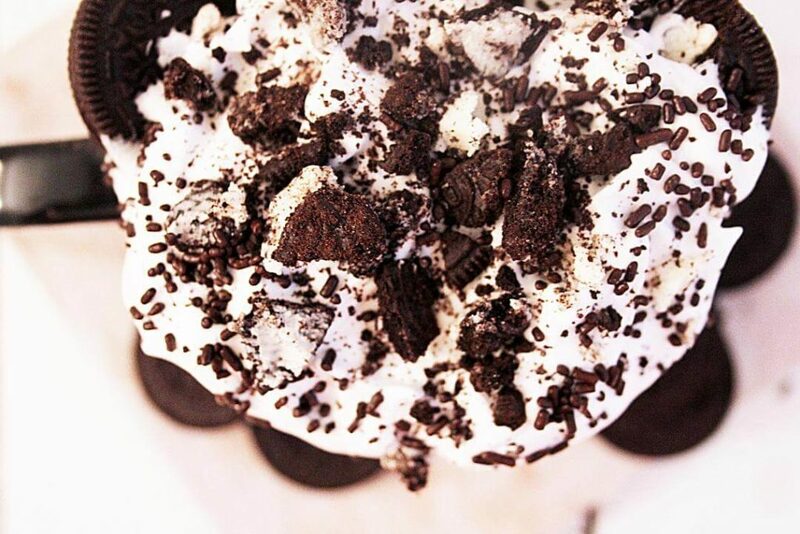 Top with whipped cream, chocolate syrup and crushed Oreos. Use the plastic bag to crush the cookies before adding them on top. This last part is totally optional but also totally delicious. It’s what makes this diy coffee drink extra fancy. 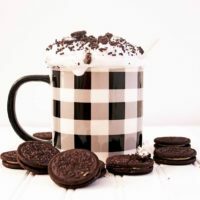 You will love this decadent cookies and cream latte! In a large coffee mug, pour the vanilla syrup and the chocolate syrup in the bottom of the cup. Pour in hot coffee and stir well. Add the half and half, if desired. Carefully, add the scoop of vanilla ice cream. 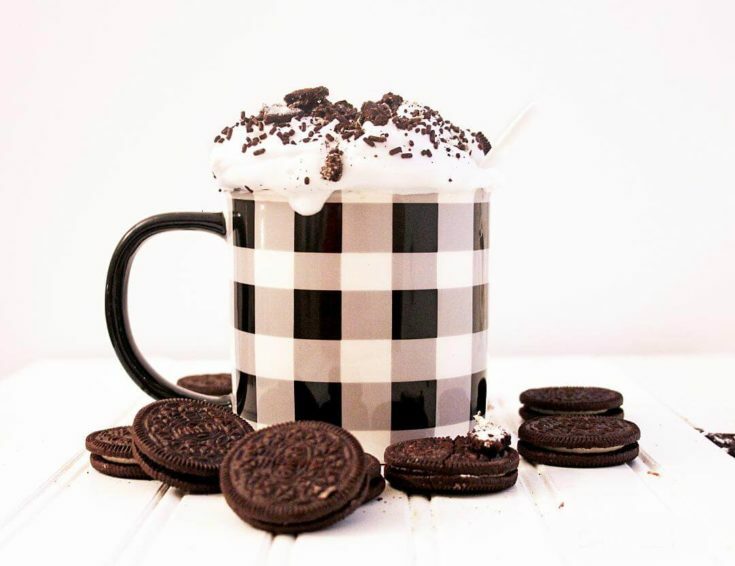 Fill the top of the mug with whipped cream, and generously sprinkle crushed Oreo's on top. 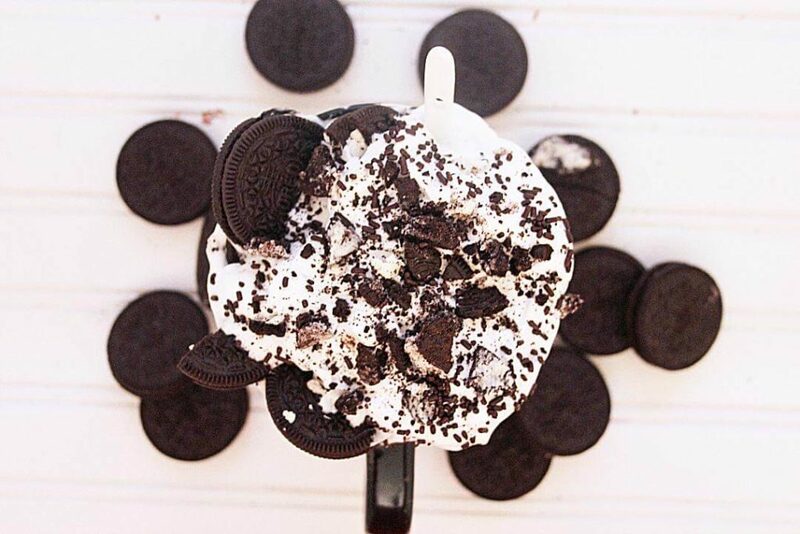 Serve with a straw and a spoon, and whole Oreo cookies on the side. I have been on a cookies & cream kick lately, so this is right up my alley! I bet it would be delicious over ice too! yum! This looks like dessert in a coffee cup! Oh wow! So lush and yummy indeed! Oh Dang!!! This is totally divine and perfect for an after dinner coffee treat! I can’t wait to make it again because it is so good and super easy too. I don’t drink coffee but this sounded so good I had to make it so I substituted hot chocolate for the coffee. So yummy!